There are several important indicators in your trading like profit and loss, timing and so on. One of them is the price action during the trade. Read this article to learn about MAE and MFE and how TradingDiary Pro calculates them. MAE marks the lowest price during a long trade and the highest price during a short trade. This helps you to identify what the maximum loss was during a trade. This is also known as maximum drawdown of the position. MFE stands for Maximum Favorable Excursion. MFE marks the highest price during a long trade and the lowest price during a short trade. This shows you what the highest profit was during a trade. 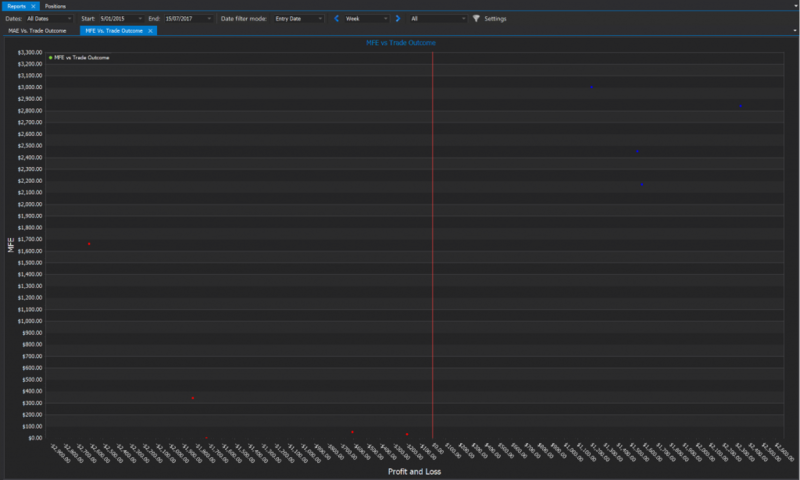 The following screenshots is the Running PnL of a trade captured from the software. If a trade was never in the loss which means that the price of a long trade was always higher than the entry price or the price of a short trade was always lower than the entry price the MAE is zero. This is the best situation what a trader can have. The opposite of that is if the trade immediately turns against you and the position was never in the profit zone then the MFE is zero. Analyzing MAE and MFE values can help you optimizing your exit strategies. If the MAE is much lower than the loss it means you don’t apply stops. TradingDiary Pro automatically recalculates the MAE and MFE values after a successful historical price data update. The MAE and MFE values are calculated in the base currency which means that the exchange rate moves could also modify the results for trades in foreign currency. The logic behind the scene is that the software gets the first bar which does not include the entry date and recalculates the profit and loss values for each historical bar. The better granularity of data is the more accurate results are. If you hold positions for longer terms from several weeks to years having daily historical data will be enough. If you hold your position for intraday or just a couple of days you will need intraday data as well. Currently there are two reports based on the MAE MFE metrics. In this report the numbers on the horizontal axis are the Profit and Loss and the numbers of the vertical axis are the maximum adverse excursion. The red dots show the losing trades and the green dots are the winning trades. The small vertical line is the zero. What do these dots mean? Let’s divide the chart into 2 sections, the left and the right one. The left side shows the loosing trades. For a disciplined trader the red dots should show follow a diagonal line starting from the origin (zero point) to the bottom left. If a trade goes against him or her it will be closed at the maximum loss by activating a stop loss. The right side shows the winning trades. The blue dots should be grouped into the zero line. This means that there were not too much drawdown on those trades. In this report the number of the horizontal axis are the Profit and Loss and the numbers of the vertical axis are the maximum favorable excursion. 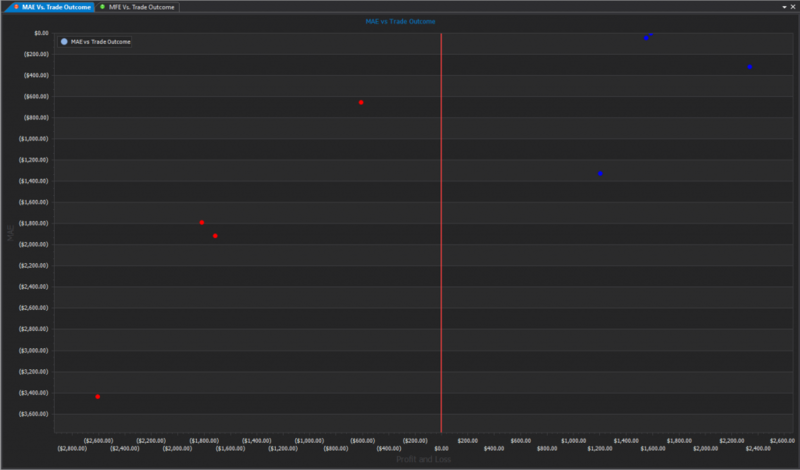 The red dots show the loosing trades and the green dots are the winning trades. The small vertical line is the zero. As you can see this chart is inverse of the previous chart. The left side shows the loosing trades. The red dots tend to the zero line. This means that the loosing trades did not go too much into the profit space before they returned and being a loss trade. This is the optimal situation which means that not too much profit was leaving on table before the positions were closed in profit. However there is one trade in the red dots which MFE was around $1650 but the trade was closed with a relatively high loss ($2600). This is what all traders have to avoid and this is a space for the improvement of one’s trade. If you would like to check how it works live in the software you can download the database from here. Please do not open it from the web browser. Save the file first. Start TradingDiary Pro and open the file from the previously saved folder. Copyright © 2009-2019Sword Tech Kft.